Around about this time last year I was preparing for a very unusual twelve days of Christmas as we awaited the arrival of my daughter in law Shan’s family from Urumqi in Xinjiang Province, China to celebrate her and Shane’s wedding and Dermot’s christening at the end of December. My daughter Claire and her husband Mike came home from Australia to join us, making last Christmas a special time and, with the benefit of hindsight, hectic, exhausting and great fun in almost equal measures. This Christmas will be different but no less special. This year we gather in Claire and Mike’s new home in the suburbs of Sydney with Shane, Shan, her MaMa and Dermot, to celebrate Dermot’s second Christmas. 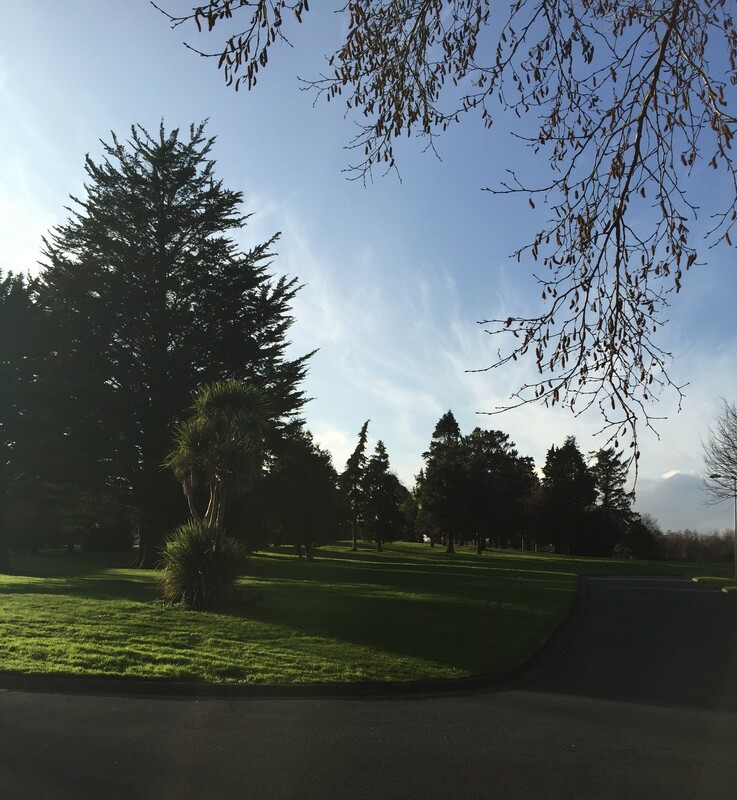 As we head into 2015 the waiting takes on a different tinge. Claire and Mike are expecting their first baby in April and Shane, Shan and Dermot are coming to live in Ireland at the end of January. There, I put all that in one sentence but the bare words don’t do justice to the repressed excitement I feel at the prospect of those events. This weekend we got our first proper glimpse of Claire and Mike’s baby in the making and it only seems like yesterday that we were looking at similar scans of little Dermot. This weekend too, by complete chance and good luck, Shane and Shan found a lovely place to live, within walking distance of our house and Bray seafront. It means that instead of coming to stay with us for some indeterminate period, they can set up their own home straight away and settle into a new life here, swapping this…. It seems as if the stars are in alignment for my offspring just now and a positive force is at work in all their lives. 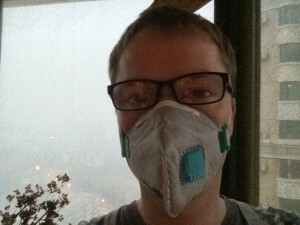 Thinking about Claire and Mike’s baby and my grandson coming to live nearby, I found myself re-reading older entries on the blog – my first letter to Dermot and Shane’s post about the day they moved apartment – and getting teary-eyed in the process. Time moves like an arrow as Shane says. Dermot has brought much joy and fun into our lives over the past two years despite the distance and I have to pinch myself to make real the thought that I will be able to see him much more often. This time around, with Claire’s child, I am more prepared for the overwhelming emotion a grandchild provokes but also more confident that it is possible to build a relationship with that little person long distance. With all that is going on it is all the more special to have Shan’s MaMa with us in Australia, knowing that she will have to take on the role of long distance nainai soon. I have been trying my best to learn a few words of Chinese so that she and I can work side by side in Claire’s kitchen rustling up stir-fried vegetables to go with the protein rich “barbies” prepared by the guys to celebrate Christmas Aussie style while Claire sits back with her feet up and Shan looks after Dermot. Well that’s the mental picture I have anyway. Which brings me, in avery roundabout way, to today’s recipes for stir-fried vegetables. When Shan and her family were with us last year, nothing went to waste in our house. Left over salad leaves were turned into stir-fries or added to fried rice or noodles. Vegetables were blanched and tossed in the wok with a few simple seasonings. It was Shan who introduced me to stir-frying lettuce. Any bag of mixed leaves that I had forgotten to serve with a steak ended up in the wok. Left-over broccoli or other vegetables got fried off with a little garlic and maybe a dash of soy sauce and sesame oil along the lines of my friend and teacher Wei Wei’s recipe for Sugar Snap Peas with Garlic. The Chinese love to cook lettuce so I wasn’t a bit surprised to come upon a recipe for stir-fried iceberg lettuce in Grace Young’s cookbook The Wisdom of the Chinese Kitchen. It makes perfect sense to me that Chinese immigrants to America would take the humble iceberg lettuce and treat it the way they would bai cai or other Chinese greens. You will find Grace’s full recipe here on Food52.com or in her book which you can get on Kindle or from Amazon.com. 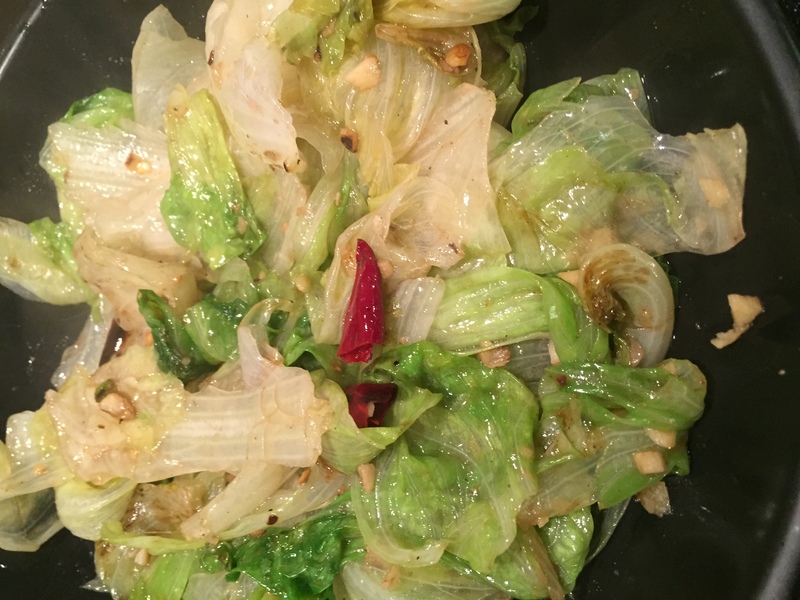 But at its simplest this recipe involves frying off some sliced or chopped garlic in a wok in a little hot oil, wilting in a head of iceberg lettuce leaves and adding a some light soy sauce, sesame oil, Shaoxing rice wine and a pinch of sugar, salt and pepper. I also like to toss in some crumbled dried chilli peppers with the garlic. It really is that easy so play around with it to get the balance of flavours you like best and use up whatever left over leaves you have in the fridge. Meanwhile back in my house my Chinese lessons with Wei Wei continue and she has also been teaching me how to cook simple side dishes of vegetables that can add colour and flavour to a meal. 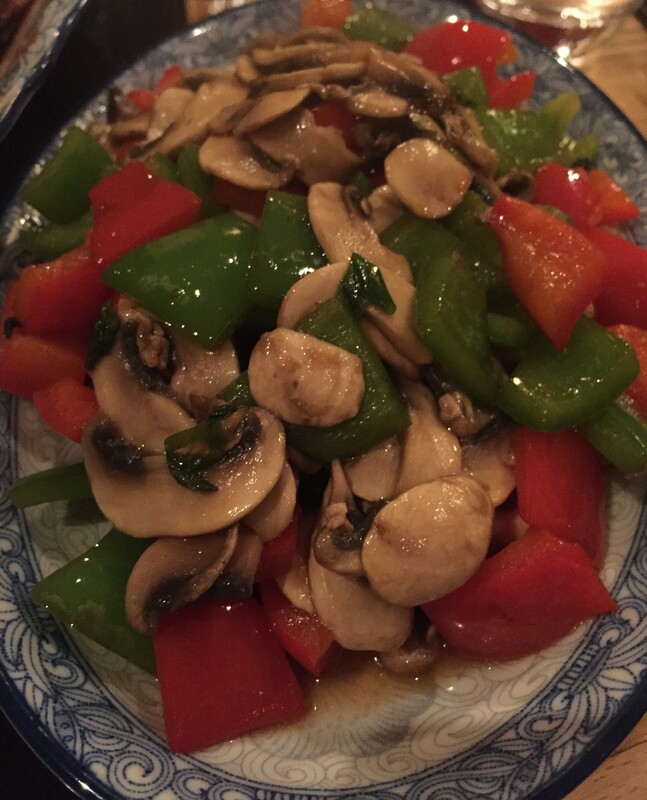 One such dish is her mushroom and pepper stir-fry. I’m sure she will post detailed instructions and pictures soon on her own blog Wei Wei’s Chinese Kitchen but here is the basic idea. Wash or wipe the mushrooms, blanch in boiling water and drain. (This step is necessary is so that the mushrooms will cook as fast as the peppers). Slice the blanched mushrooms and cut the peppers into wedges. Cut the spring onion into sections. Heat the wok, add 2 tbs cooking oil and when the oil is hot add the spring onion, stir-frying briefly until the flavour is released. Add in the peppers and stir-fry briskly for about two minutes until they begin to char and. Add the mushroom slices and mix well. They will only need a minute or so to cook. Season with soy sauce, sugar and salt to taste and serve immediately. I look forward to Shananigans taking a Christmas detour to the southern hemisphere and to keeping you posted on some more culinary adventures.